With the different schemes it’s getting harder to put players into categories. What I’ve decided at this point is to simplify the categories. 1-Harold Landry, Boston College- had 16.5 sacks and an amazing seven forced fumbles in 2016. 2-Arden Key, LSU- may have more upside than Landry but currently I think Landry is a better pass rusher. Could miss opener with injury. 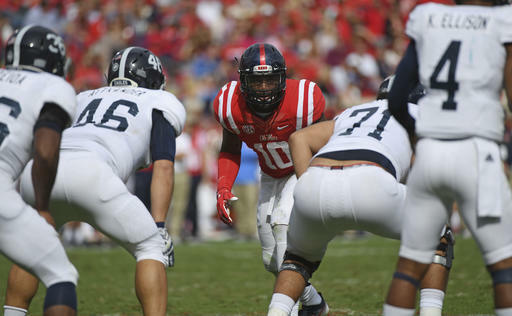 3-Marquis Haynes,Ole Miss- pure pass rush specialist. 24.5 sacks in 3 years. 4-Tyquan Lewis, Ohio State- Ohio State just loaded on defense. He’s a three year starter. 5-Bradley Chubb, NC State- brother of Nick (RB Georgia). Like his versatility, could slip inside in some pass rush schemes too. 1-Christian Wilkens, Clemson- played DE too, but think he’s best at a 3 technique. 2-Vita Vea, Washington- light on his feet, was a wildcat QB in high school. 3-DaShawn Hand, Alabama great at taking on double teams and allowing other to roam in Saban’s system. 4-Derrick Nnadi, Florida State- great nose tackle with more pass rush skills than you usually see from that position. 5-Maurice Hurst, Michigan- one gap player that lives in opponents backfields. Only 280 lbs, which is a concern. 1-Malik Jefferson, Texas- a tackle machine with high upside. Guys two and three on this list might be better players right now. 2-Cameron Smith, USC -will not wow at the combine, but a great football player with great instincts. 3-Azeem Victor, Washington- he’s the key to the Huskies defense. Always in the right spot. 4-Jerome Baker, Ohio State- think of Darron Lee, former Buckeyes player. 5-Tremaine Edwards, Virginia Tech- long and rangy could play inside or outside. 1-Iman Marshall, USC- can pound people in press coverage. Big, strong can play safety as well. 2-Tarvarus McFadden, Florida State- led nation with 8 INT’s. Torn labrum in ’16. 3-Anthony Averett, Alabama- reminds some of Bills Tra’Davious White. 4-Adonis Alexander, Virginia Tech- better of the two good Tech corners. 5-Denzell Ward, Ohio State- sat behind Lattimore and Conley last year, this is his year to shine. 1-Derwin James, Florida State- nicknamed ‘The Freak”. Team leader, love this guy. 2-Minkah Fitzpatrick, Alabama- long line of Alabama corners. Versatile, can play safety or corner. 3-Marcus Allen, Penn State- made 22 tackles in one game last year against Minnesota. 4-Godwin Igwebuike, Northwestern- stands out every time you watch a Northwestern game. Three year starter.